At Goldfaden MD, we’re all about safe and natural facial treatments. But here’s the thing—if we’re going to fit any new products or techniques into our beauty routines, they have to actually work. If it’s not efficacious, we’re just not interested. We created our Needleless Line Smoothing Concentrate for exactly that reason—we wanted to see fine lines and wrinkles diminish by the time we woke up in the morning. Yes, our obsession with the Needleless Line Smoothing Concentrate is real, and we’ve been actively searching for a non-invasive treatment that works as well as our formula and is also safe for skin. And then we stumbled across gua sha facial massage, and our complexions were changed (and lifted. And toned.) forever. Gua sha (pronounce gwah-shah) is a popular therapeutic technique used in Eastern Asia to encourage blood flow and healthy chi energy, decrease muscle pain and inflammation, and treat tension in the body. Traditional gua sha is performed all over the body, much like a massage. In Eastern Medicine therapies, it’s believed that stagnant chi (or energy) is usually the root cause of chronic illness or disease. Gua sha naturally encourages healthy blood flow to the body—which is why it’s so helpful for treating inflammation—and moves the chi throughout the meridians. Meridians are the energetic life force paths all over the body that act as a mainstay of Traditional Chinese medicine and are used as a guide for everything from acupuncture to acupressure to gua sha. If you do a quick Google image search, you’ll be confronted with images of bright red backs, ripe with bruising and striations. Don’t be scared! It looks intense—borderline masochistic, perhaps?—but gua sha is actually wonderful for skin, muscles, and fascia. Enough pressure is applied during a full-body session to result in light bruising, which is part of the reason gua sha is so healing for soft tissues. Much like getting a deep tissue massage, gua sha encourages movement in the lymph system to encourage detoxification and improve blood flow to muscles and tendons. As soon as the lymph fluid is stimulated through massage, the body can begin to detoxify itself. If you’re the one receiving a treatment, you’ll notice that any water retention or bloat totally vanishes after a treatment. When the lymph begins to move, it carries with it lingering toxins and extra water that’s holding on for dear life in your body. Gua sha also can help to break down scar tissue and stagnant connective tissue to improve mobility and flexibility in joints. In recent years, facial gua sha has become incredibly popular as a beauty treatment. Anecdotally, it’s been said to improve nearly every skin condition—from hormonal acne to sagging jowls. Facial gua sha is significantly lighter in pressure than a full-body treatment, so don’t expect to see bruising or even light marks on your skin. However, you’ll likely experience instant lifting, toning, and brightening after getting a gua sha facial or trying the technique out on yourself (yep, you can totally do this one at home!). Keep scrolling for the low down on how gua sha works, who uses it now, and exactly how to perform gua sha on yourself. The biggest difference between a massage and a gua sha treatment is the gua sha tool. Typically made of jade or rose quartz, a gua sha tool is about the size of a credit card and can be held in one hand. The tool itself has smooth edges on all sides and is about a quarter of an inch thick. To use it, your practitioner will hold the tool at a 15-degree angle to your skin with one edge gently resting on the area to be worked on. Using long, fluid strokes, the practitioner applies pressure and drags the gua sha tool along the appropriate meridians (or muscle knots) to stimulate the chi and break up muscle tension and adhesions. Usually, a practitioner will go over the same area a few times. You’ll notice as they begin to work through the fascia, the area around the muscle immediately begins to release and relax. It’s really important that your practitioner moves the lymph all the way through your body to the end of the meridians—you don’t want to get that nastiness stuck anywhere! And if you’re the one enjoying the treatment, remember to drink tons of water the day after your appointment—you’re going to need it. Gua sha facials aren’t all that different from the massage treatment—both use the same tool and technique. But, facials require a much lighter touch because pressing too hard can damage skin. Plus, our facial muscles don’t usually have the same scar tissue or adhesions as say, your quad or calf muscles, which go through a lot more wear and tear. With the face, we’re more concerned with moving and draining the lymph fluid; stagnant lymph causes puffiness, bloating, dark circles, sallow skin, wrinkles, and pimples. And because it’s a very light massage, you might even notice that gua sha eases any tension that you might be holding in your forehead, jaw, and eyebrows. Just remember that it’s not necessary to apply heavy pressure, and in fact, if you’re pressing too hard you won’t be targeting the lymphatic material. Lymph lives just below the skin, and is so sensitive that it won’t respond to roughness! When it moves through the body in a healthy way, our puffiness diminishes. We get our natural, youthful glow back because our bodies are naturally detoxifying themselves. And the improved circulation helps flush toxins and revitalizes the look of skin. After a gua sha facial, you’ll likely see instant results. Your brows and cheeks will look more lifted, and cheekbones will be more defined as excessive lymphatic fluid drains from the face. Skin will look brighter because of increased blood flow. And because you need to use a facial oil or emollient lotion whenever you gua sha, your complexion will be hydrated, too! Gua sha treatments are typically performed by trained professionals. When it comes to full-body massage, practitioners are usually certified in the technique and also have their massage license. Estheticians and facialists also must go through a training to learn how to properly use the gua sha tool on the sensitive facial skin. It’s safe to try giving yourself a gua sha facial treatment at home, as long as you’re not pressing too hard. If you see redness on your face, you’ve gone too far! A little goes a long way with this stuff. And trust, you don’t want bruise lines on your face—it’s not a good look. To give yourself a gua sha facial you’ll need a gua sha tool, facial oil, and about five minutes of free time. We also recommend grabbing a towel, just in case! When purchasing a gua sha tool, make sure you get one that’s made of real stone like jade, rose quartz, or brian stone. Beware of super-cheap versions on Amazon—they might be made with dyed acrylic, which is bad for the planet and bad for your skin health! Also, the real things look very cute on Instagram. Really important to up your self-care ‘gram game. Before you get started, wash your face thoroughly. No make-up, no nothing. You want to be barefaced, babe! We recommend double-cleansing with the Pure Start Gentle Detoxing Facial cleanser to remove any dirt or grunginess from the day, and then following up with the Detox Clarifying Wash to give pores the clean sweep. Apply a few drops of Fleuressence Native Botanical Cell Oil to the skin. This golden elixir contains Kalahari oil, Mongongo oil, Rosehip seed oil and Baobab oil to boost skin’s natural radiance, improve tone, and fade scars. You want the gua sha tool to gently glide against the skin, so don’t be shy about using a little more oil than usual. – From the middle of the under the chin to the earlobe. Repeat on both sides. – From the middle of the ridge of the chin (follow your jawline) to the earlobe. Repeat on both sides. – From the lower edge of the nostril up to the middle of the ear. Repeat on both sides. – From the inside of the eye, lightly draw the gua sha tool to the temple. Repeat on both sides. – From the inside of the eyebrow, follow the brow bone to the temple. Repeat on both sides. – From the middle of the forehead to the hairline. Repeat on both sides. – From the hairline, sweep all the way down, around the back of the ears, down the sides of the neck to the collarbones. Repeat on both sides. When you’re done, you should notice an instantaneous difference in your skin! Gua sha massage acts like a natural mini facelift—and it feels really amazing. Summer’s here. It’s time to hop a flight to the Amalfi Coast, or Tulum, or Bali—somewhere with clear water, sandy beaches, and a very weak wifi connection. You work hard to cash in your vacay time—and you deserve to put on your email autoresponder and soak up every last minute of it. But if you’re relying on air travel to get to your destination, you might have an unfortunate guest crash your precious time off: jet lag. Jet lag manifests itself in so many different ways, both physical and mental. Think fatigue, bloating, insomnia, irritability, digestive issues, and general stress. None of the symptoms are fun on a normal day, let alone on your dream vacation. And then there’s the damage that dirty airports and pressurized air cabins can do to your complexion. We’re talking dehydrated skin and clogged pores galore. You want to come back from your break looking like a refreshed, glowy, and relaxed supermodel—not like you’ve been to hell and back again trying to make it through customs. It’s possible to make it through all of your summer travel looking great and feeling even better. It’s all about fighting the dreaded jet lag bloat; and with the right products, foods, and supplements, you should be just fine. 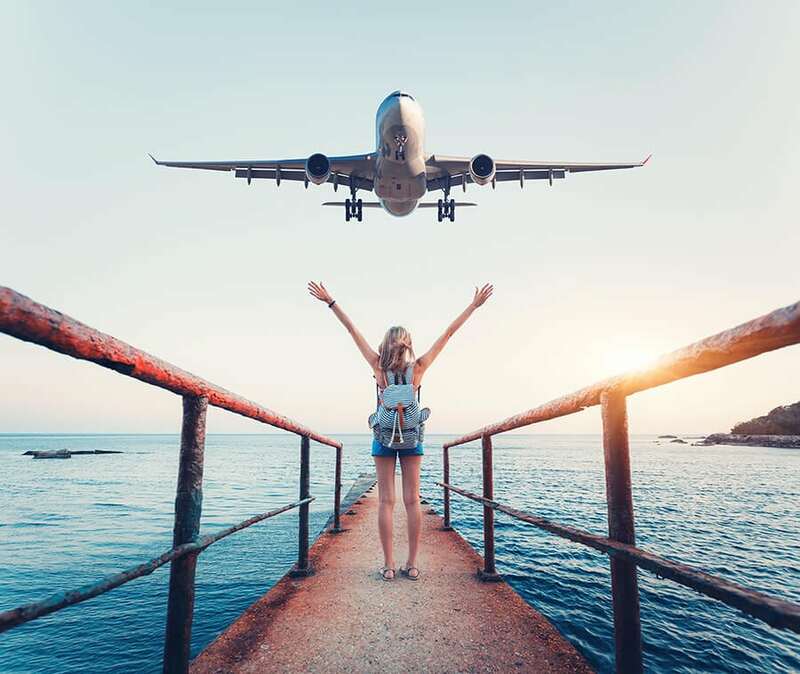 Keep scrolling to get the skinny on how to beat jet lag and keep your skin looking fresh no matter how far you travel this summer. You’ve gotta know the enemy in order to properly defend yourself. Jet lag, or desynchronosis, is a temporary circadian rhythm disorder that often occurs when a person travels across time zones. The body’s internal clock is disrupted, and major symptoms include insomnia, fatigue, bloating, anxiety, malaise, and emotional disturbances. When a traveler crosses a few time zones, the body uses natural cues like sunlight and an eating schedule to try and acclimate to the appropriate time. But because travel is disorienting for the physical body, it can take a few days before all the natural processes even out and become normalized. Jet lag is usually worse when moving from west to east because travelers lose hours of their day. If you’re traveling from New York City to Mykonos (hi, take us with you? ), you’ll lose seven hours of your day. Meals, sleep, and bathroom schedules will all be pushed by seven hours, which certainly messes with your routine and your body’s ability to adapt to a new place. Travelers also tend to underestimate the toll that airports and planes have on their wellbeing, too. Stressful security checks, unhealthy airport food, and omnipresent air conditioning can wreak havoc on the most resilient complexions. If you’re prone to breakouts, touching grimy bathroom doors and tray tables and then rubbing your face can exacerbate acne. And even if you are getting sleep on the plane (or in the airport) it’s likely not high quality zzz’s. Rest is incredibly important for cell turnover and skin recovery—in fact, regeneration happens three times as quickly during sleep as opposed to waking hours. Feels like everything is working against you when it comes to gorgeous skin while traveling? Fortunately, that’s not the case. When you know what to do to combat jet lag, you improve the chances that you’ll enjoy your time off … and that when you do land back at home, you’ll still be rocking that “I-just-spent-a-week-without-conference-calls” glow. If possible, try to book a flight that lands later in the evening at your final destination. Your goal is to basically hop off the plane and jump into your hotel sheets—getting sleep is the best way to acclimate to a new place. If you’re totally topsy-turvy when you land, grab a little something to eat. A light meal that’s rich in carbs will trigger serotonin release, and that can help you fall asleep more quickly when you do finally get to bed. Before you retire, try giving yourself a light peel treatment. We love the Fresh A Peel Multi-Acid Resurfacing Peel because it’s gentle but effective. The peel will obliterate any dry skin or dull skin that may have happened as a result of air travel and makes it easier for your skin to drip up a rich moisturizer like our Plant Profusion Night Cream. The plant stem cells in our night cream will encourage cell turnover and recovery, so you’ll get more bang for your buck as you sleep even if your REM cycle isn’t as long as normal.